There are still over 10 units owners yet to make your contribution. Plz do so within this week or your access cards will be barred and re-connection fee will be imposed on top of the 4 months maint fee. I have noticed there are still a lot of residents still paying using cash, really appreciate if the residents could make payment using cheque in the next round of collection to ease the job of the RA and also the risk involved in handling of cash. As the due date for collection (15/9/2012) is passed, those who still not pay their fair share please do so to avoid your access being deactivated. the reactivation charge is extra RM50.00 on top of what ever amount due. As you all know the guard house can not be in operation without each and every single resident’s support. We have given ample notice and reminder, A1 size large bill board at the guard house, please do not wait and rush at the last minute. please make life easy for everyone here, We should be thankful to the Treasurer, zone leaders, RA committee and the security guard for keep reminding your obligation as a cooperative and responsible resident of TPP8A. Once over due by 15/9/2012 your access card will be deactivated. an it is tedious to be reactivated plus RM50,00 additional charges. So please make your contribution promptly to avoid unnecessary argument and inconvenience after the due date. 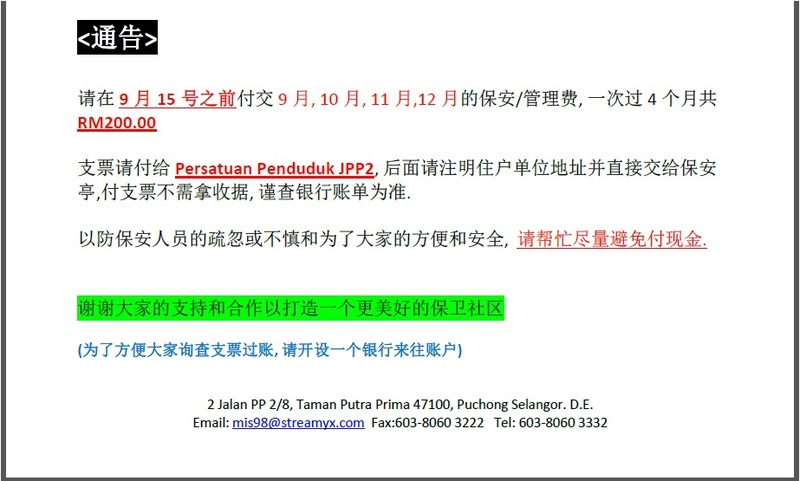 Plz be reminded that the due date for Sep-Dec 12 maint fee is this Saturday 15/9. Your access cards will be deactivated if no payment is received by the due date. It will take time to re-activate the access cards and to avoid inconvenience, plz ensure to make your contribution without delay. Thank you for your attention. Please be reminded that the due date for Sept – Dec 2012 maintenance fee is 15 SEPT 2012. Please make your contribution as soon as you can to avoid access cards re-connection fee of RM50 if no payment is received by the due date. Thank you for your co-operation in making our Taman a safe & secured place to stay. Suggest to give receipt to the people who make the payment. The receipt can be pre-prepare and pass to the owner upon they make the payment by cash/cheque. The cost of the receipt for sure is much cheaper than the “Datoship” plate which is put on the commitee house. Dear Mr Tan Boon Hock, the problem is not the cost of the receipt, it is the education level of the security guards, that is why we keep sending reminder don’t handover cash to the guards, moreover the RA simply can’t afford to hire a full time clerk/cashier, receival of cheque without proof of transaction is still considered as unpaid even if receipt is issued. If some Zone leader willing to issue receipt and collect cash from you, we have no objection. Our advice is paying cash is unsafe and everyone need to be very cautious when too much cash is in hand. More over paying cash you need face to face for counting the note, unlike paying by cheque, you can just hand over to guardhouse anytime, without the need to make appointment to see zone leader or call in at late night to check whether he/she is free or at home. I think the voluntary hard working committee members deserve certain level of respect and recognition from the residents, no one is obliged to serve anyone here, please mind your language. you won’t get a Datuk-ship for serving your neighbor, They don’t get a cup of coffee either. You are most welcome, if you wanted to come in and join us to serve the community of our own home……. One of the reason why we have decided to discourage giving out Official Receipt (OR) is to encourage the residents to make payment by cheque which is a much safer mode of payment for the residents as well as for the committee members. We are trying to minimise handling of cash because any committee members may accidentally lost or misplaced the cash, who have to bear the lost? Please be reminded that no committee members are paid for doing the RA works and we have to be considerate towards them in regards to the risk involved. FYI, I work in a company and handle the payment process and whenever we make payments to suppliers, only 10% of the payments we make come with OR issued to us. Mind you, some of the payments were more than RM100,000. Do you know why we didn’t insist on the OR? Because we know the cheque is make up to the suppliers’ name & there is no way for them to deny that we have make payments. In any legal case, the suppliers need to declare they didn’t received the payments to the court and if later it was proven by the customers that payments are actually made, the suppliers will be penalised by court for giving false evidents. On the matter regards to committee plaque, please la, having the plaque fitted to the committee members house doesn’t mean all previlage, it is also means residents can easily identify them and any problem or complain, they will straight ring the door bells at the committee members’ house. But that doesn’t mean that we will shy off from the residents but we will try our best to voluntarily find time to assist the residents, within the confine of the Malaysian law, of course. In any case, we are not like a management company of a condo/apt where they have full set of employees to run the condo/apt and that come with a much higher fee and much higher number of contributors/owners. They can & afford to buy insurance to cover the lost of cash. We can’t, because we don’t have a permenant premises, one of the requirement by the insurance company. So, please be responsible when you make any comment about the committee plaque and giving name to it. Dear Mr Tan BH, I think our chairman and the treasurer have clearly clarify and answer your comment which . What I want to say is your suggestion and comment are welcome any time, however please mind your language while make any speech in this “public area”. As a well educated person or even not but with good ethic, I think this word shouldn’t come out from this stage. Don’t you feel that this word from you will insult the committee member even drastically damage the image and reputation of your self? The committee members never earn any single cent from the RA but just given all the effort and time to serve the resident. The committee members also same like yours having family members, thousand load of works, economy and time limitation. Just to remind that such an awkward wording should think twice prior post in the public. You are always welcome to join us RA in order to continue building a harmony and serve the resident of TPP8A. Thanks for your comment.